We’re excited to share a project we finished this year that was a first for us in the Special Collections, and one that we hope will serve as a pilot for future collections. In the summer of 2018, the New York Foundation for the Arts Records were fully opened for research in the Fales Library and Special Collections. At just under 230 linear feet, it’s a large collection, but it remarkably never sat on our processing shelves for more than a few weeks. Back in the Spring of 2016, the Fales Library and Special Collections entered into a partnership with the New York Foundation for the Arts (NYFA), with the goal of preparing the Foundation’s archives for donation to Fales. NYFA agreed to take responsibility for processing their own records, with guidance from NYU’s Archival Collections Management team and Fales curators. The collection, estimated at 1000 linear feet pre-processing and documenting almost 50 years of operations, would be processed at NYFA’s facility by archivists hired in consultation with NYU Special Collections. The project presented us with many challenges, expected and unexpected, that can arise when collaborating across disparate institutions and departments. After initial curatorial conversations about how the NYFA Records fit well into Fales’s collecting areas, ACM and Fales agreed to the project and signed a letter of intent with the NYFA board, solidifying our plans to coordinate the pre-custodial processing of the NYFA Records. Happily, the NYFA partners were eager to begin work. In addition to seeing their history and documentation available for scholars, NYFA was particularly motivated by the promise of accessing their archives to support planning for the organization’s 50th anniversary in 2021. The initial inventory of NYFA boxes in a records storage facility. 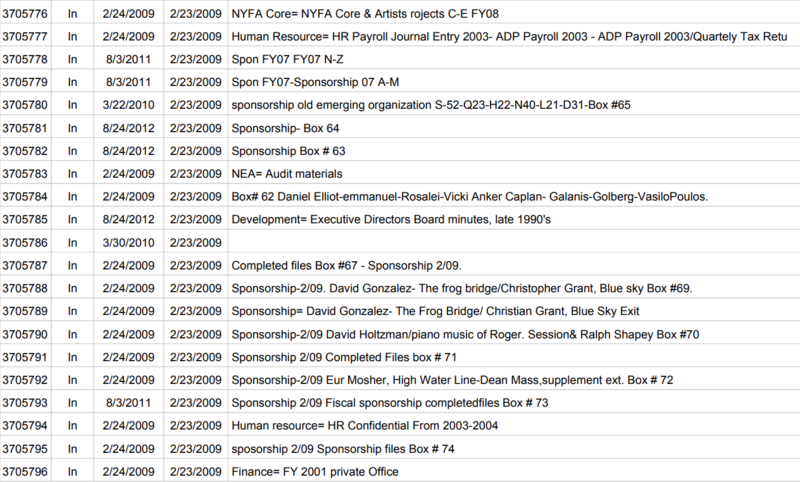 All the of the information that both parties—at NYU and NYFA—operated off of was a spreadsheet manifest of materials at the records storage facility where the archives were held. The limited amount (and questionable accuracy) of description and intellectual control made project planning and timeline development speculative at best. Fortunately, our partners at NYFA were amenable to our idea to phase the project. The NYU archivists suggested hiring a project archivist initially to survey the collection and shape future phases of the project. The funder could then approve phases of work developed by the project archivist, informed by a survey and processing plan. 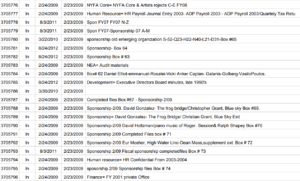 Once we agreed on phasing, NYFA posted for a project archivist and NYU assisted with circulating the job posting, evaluating, and interviewing candidates. The first NYFA project archivist worked with an assistant archivist from August to December of 2016. In that time, she was able to quickly earmark at least 200 linear feet of routine financial records for immediate shredding, which helped us to begin understanding the actual size of the collection we would be taking in. She also drafted a processing plan and provided informed cost and phasing estimates to the NYFA board, which gave the trustees and funder a much more concrete picture of how much time, energy, and money a fully processed collection would require. Because our stakeholders were very engaged and motivated to see the completion of collection’s processing, they were open to reimagining the size of this project from an initial expectation of 6 months to closer to 2 years. And NYU stakeholders were able to define a clear desired outcome: the collection could be delivered to NYU and accessioned in tranches of about 50 linear feet, which would then be accessioned and opened for research immediately. With the NYFA archivists in place and a processing plan approved, determining how and when both the physical materials and the descriptive data would be transferred was our next hurdle. At NYU, we liked the idea of having the NYFA archivists work directly in the Fales ArchivesSpace repository, or at least a NYFA repository within our ArchivesSpace instance. We ended up not being able to go this route, because of our network security and authentication, so we came up with a system for importing CSVs of container list data, broken down by series or subseries, based on Harvard’s Spreadsheet to EAD method (which is now an ArchivesSpace plugin). The NYFA archivists submitted description via Google Docs, and our accessioning archivist dropped it into the appropriate tags in the EAD file before uploading into ArchivesSpace. Running through the various options and getting to this decision point was cumbersome for everyone, but the system we settled on proved the most efficient and simplest method for moving data between the institutions. While there was some turnover in project staff–a common risk with term-funded projects–the project mostly proceeded on schedule. NYFA archivists submitted a processing plan in January 2017, and made the first transfer of boxes the following year, in January 2018. While it took months longer to coordinate the first transfer than we’d initially expected, we were able to develop a good system. To kick start a transfer, the NYFA archivists would email description and container lists for review and approval, along with the estimated size of the transfer. If the description adhered to DACS and our local requirements, archivists and conservators scheduled a visit to NYFA for a final review of the boxes, ensuring all materials were housed to meet baseline preservation standards. 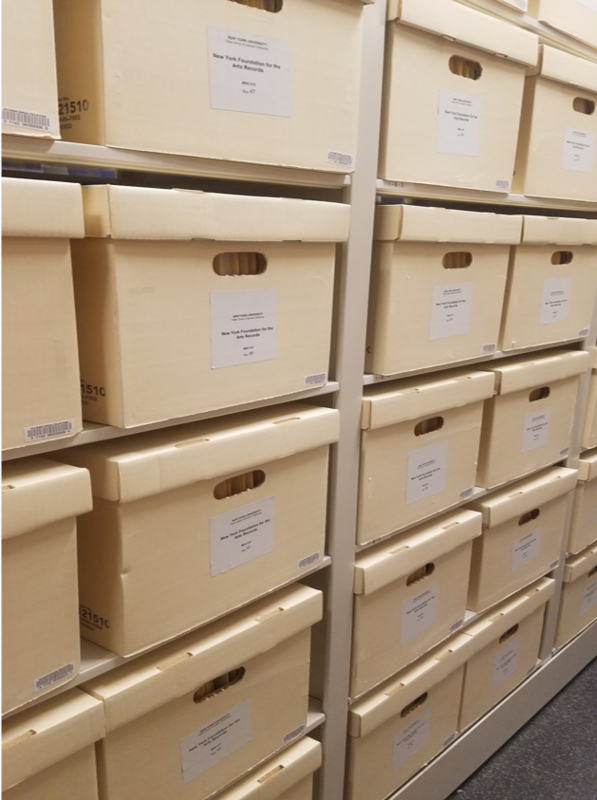 With each transfer, the accessioning archivist scheduled a pickup of the boxes, accessioned them into Fales, imported the descriptive data, and opened the new series to researchers within days of receipt. Boxes processed at NYFA, accessioned at NYU, and ready for researchers! Overall, we’d consider this to be a successful pilot and a replicable model that we’d absolutely use again if a donor is willing. Having the collection shrink from 1000 linear feet to 230 linear feet–without having it sit on our shelves for years–is huge, and being able to leverage the flexibility in our systems to import months’ worth of work in minutes and make accretions of 50 boxes available within days of receipt is landmark for us. We’re at work on a full case study of the NYFA processing project, along with a toolbox of the documentation and plans we consider important for a project like this. Get in touch with us if you’re considering a pre-donation processing project; we’d love to hear about different approaches that others are taking. Last, but certainly not least, we’d like to thank our teammates at NYU and NYFA who helped ensure the successful completion of the project: Stacey Flatt, Nicholas Long, and Kris Santos (NYFA Project Archivists); Rachel Searcy (NYU Accessioning Archivist); and Laura McCann (NYU Conservation Librarian). 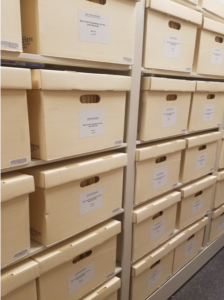 I'm the Head of Archival Collections Management, where we analyze, accession, arrange, and describe archival materials to make them accessible and ensure long-term preservation.